Bots High is a documentary by Joey Daoud that follows three teams of high school students as they build combat robots for a national competition (see the trailer). The filmmakers are planning a Worldwide Screening Day on October 6. Some kids play football in school. Other kids build bone-crushing combat robots with the expressed purpose of dismembering competing bots in thrilling caged-death matches. This film is about kids in the latter group. 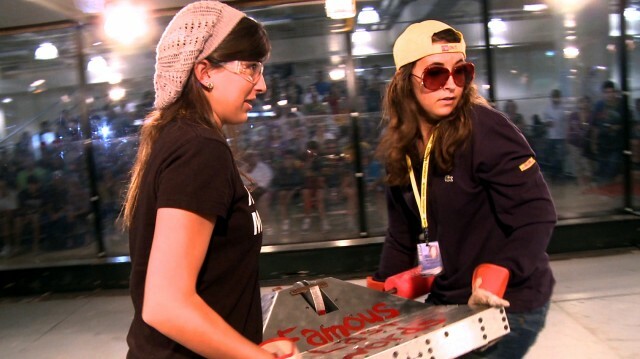 Bots High follows three teams of high school robotics geeks who build and battle their way to a national robotics competition in Miami. Our heroes include genius inventor Will, who constructs seemingly indestructible bots that unfortunately self-destruct (sometimes in a cloud of smoke and flames), and My Mechanical Romance, a team of Catholic school girls who stand out amid male bot participants with a combination of beauty, brains, and fashion sense.